It was a one-point game after the first quarter. It was a one-point game at the half. And it was still a one-point game after three periods. 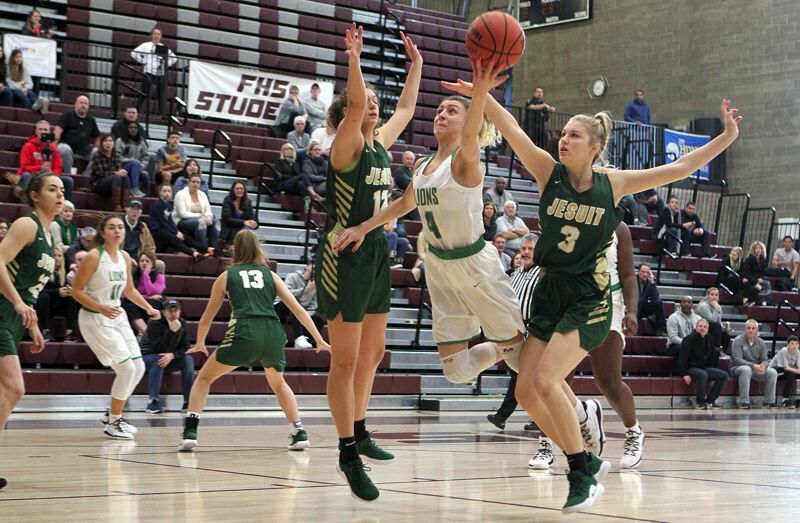 But the West Linn girls basketball team — facing Jesuit on Saturday in Day Three action at the PIL Holiday Classic at Franklin High School — made sure it didn't stay that way. The Lions stitched together a 15-2 run in fourth-quarter crunch time and used that burst to leave the Crusaders behind, eventually winning for the second day in a row at the tournament, beating Jesuit 60-51. "I think it was just teamwork," explained West Linn junior wing Elisabeth Dombrow, who finished with 12 points against Jesuit, eight in the second half. "We all just worked together and believed in each other, and what I love about our team is we always pick ourselves up no matter what. We always encourage each other to do our best." "I think (we won because of) our rebounding," added sophomore guard Audrey Roden, who led all scorers with 27 points. "I think we just wanted the ball more than they did and went and got it. That created more shot opportunities, and the more rebounds you get, the more possessions you have." Along with their other two tournament games — the Lions opened with a 63-48 loss to Beaverton on Thursday, then beat McNary 52-39 on Friday — West Linn took its season record to 5-3 overall. Jesuit, meanwhile, opened with a 61-47 loss to Sierra Canyon of California, then beat McMinnville 52-37 to see its record move to 8-2 on the season. The Lions got nine first-quarter points from sophomore post Aaronette Vonleh, but saw Jesuit answer with four each from Anna Fanelli and Taylor Freeman to lead 14-13. In the second period, with Vonleh on the bench due to two fouls, Roden took over, hitting four times from the field (including one 3-pointer) and both her free throws to pile up 11 points while Dombrow added four. Jesuit stayed close behind Bella Mori's seven and three each from Fanelli and Savanna Corradini, but West Linn took a 30-29 edge into halftime. Vonleh came back strong in the third with eight more points, Roden added four and Dombrow hit a "3," but Jesuit matched the Lions, getting six from Fanelli (including a 3-pointer), another five from Freeman (also with a "3") and the two teams rolled into the fourth with West Linn leading 45-44. The Crusaders drew even at 45-45 on a Mori foul shot 14 seconds into the fourth quarter, but their good fortune ended then and there. Beginning on the next possession when Roden hit a hanging jumpshot in traffic from the left side, the Lions took off on a 15-2 run over a span of 6:45 that boosted their lead to 60-47 in the final minute and essentially sealed Jesuit's fate. "Our strengths are that we just keep fighting every possession, to not give up on any plays and just make sure we are all in for all four quarters," said Vonleh, who finished with 17 points despite her limited court time. After Roden's basket, sophomore guard Cami Fulcher hit a free throw, Roden made a steal and scored on the fast break, and Dombrow rebounded a Roden miss and scored in the air to boost her team's lead to 52-45 with 3:15 left on the clock. Corradini answered with a putback of her own miss to cut the Lions' edge to 52-47, but West Linn pulled away from there. Roden scored on a drive, Dombrow took a long Roden pass, scored on the fast break and turned it into a three-point play, and Roden hit 3 of 4 foul shots from there for a 60-47 lead with just 53 seconds to play. Fanelli led Jesuit with 13, Freeman added 11 and Mori 10 in the loss. After dropping their tournament opener to Beaverton, the Lions came back strong against McNary, using big first and fourth quarters to pull away from the Celtics 52-39. Roden and Vonleh combined for 11 first-quarter points to help stake their team to an early 15-9 lead, then saw McNary edge back within 35-27 after the second and third quarters. Roden and Peyton Shelstad both hit "3s" in the second quarter and Roden had four points in the third, but the Celtics got seven points each in those two periods from Leah Doutt and Abigail Hawley to keep their team in contention. The Lions pulled away with a 17-12 edge in the fourth, though, getting six points each from junior post Vanessa Viuhkola and Vonleh while McNary tried to stay close behind Sabella Alfaro's five. For the game, Vonleh had 18 points, Roden scored 10 and Viuhkola had eight. For McNary, Doutt led the way with 12 points and Hawley had 10. The Lions' tournament opener against Beaverton was a tale of two halves, but unfortunately for West Linn, the Beavers' first half was better than the Lions' second half. Beaverton knocked down five 3-pointers in the first quarter — two from Sydney Erikstrup — and grabbed a quick 19-9 lead, while the Lions got four foul shots from Fulcher and a Shelstad "3." There was more trouble in the second quarter, too, with Beaverton dropping an 18-7 edge on the Lions that extended its lead to 37-16 at the half. The Beavers kept the heat on from long range in the second, getting two 3-pointers and eight points from Alexa Borter and another five points from Mackenzie Naro. For West Linn, Vonleh scored four points in the period to lead the Lions. Undaunted, West Linn came back to win the second half, outscoring Beaverton 13-12 in the third quarter behind seven Roden points and another four from Vonleh. The Lions did it again with a 19-14 advantage in the fourth, with Roden breaking loose for 14 points and Fulcher chipping in three more. After the tournament, the Lions said the solid competition had made them better and shown them where they still had room to grow. "The improvement I've seen is just building off losses and taking where we are weak and making it stronger in the next game," Vonleh said. "I think we are all on the same page after the games we've played since the beginning of the season." "As a team, I think we can get better by looking inside more to (Vonleh) — she's an amazing player and so just using her," Dombrow said. "And just … going out there and getting those rebounds and free balls and putting in that effort." Next up, the Lions play at Westview at 7 p.m. Wednesday, then host Lakeridge in both teams' Three Rivers League opener at 5:45 p.m. Jan. 8.